We’ve got a lot of recipes to get to for the Big Game — so we’ll keep this one short. We’re bringing you a meal for every quarter. Start off with some beef nachos, fill up on a buffalo chicken pizza, then feed your sweet tooth with chocolate hazelnut brownies and chocolate chip football cookies! Prepare your beef by placing it in a frying pan over medium-high heat and cook for about 3-5 minutes or until cooked through. Drain excess oil and then add in the minced garlic, chili powder, salt, onion powder and cumin and sauté for another 2-3 minutes. Open the bag and add roughly 1/4 cup prepared beef and desired toppings. Hold the bag closed with your hand and shake it up. Pop that sucker open and dig in! Preheat oven to 400 degrees F and prepare a baking sheet with parchment paper. in a mixing bowl, toss the buffalo sauce and chicken until well coated. Remove pizza from the package, removing plastic cover and cardboard plate and place it on the baking sheet. 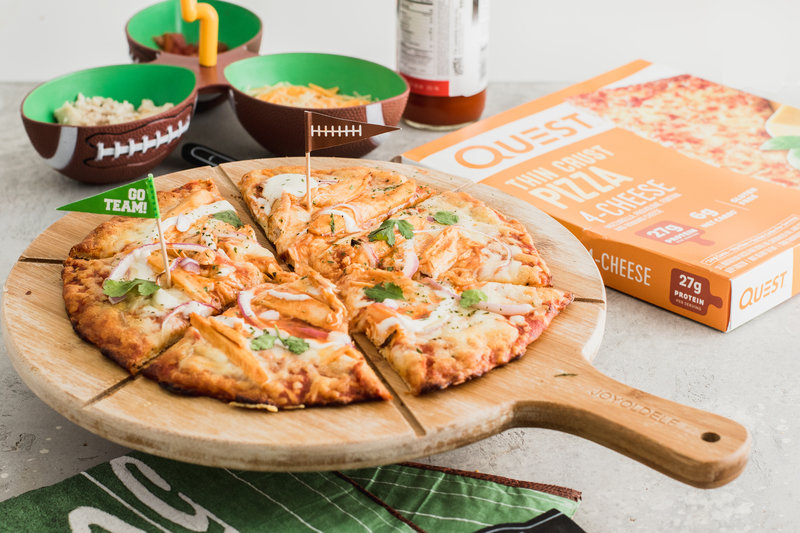 Arrange the buffalo chicken and onion on the pizza and cook for 18-20 minutes. Remove and drizzle with ranch and garnish. Preheat oven to 350 degrees and prepare a 6×6 inch pan with parchment paper both ways for easy removal. Also prepare a baking sheet with parchment paper. 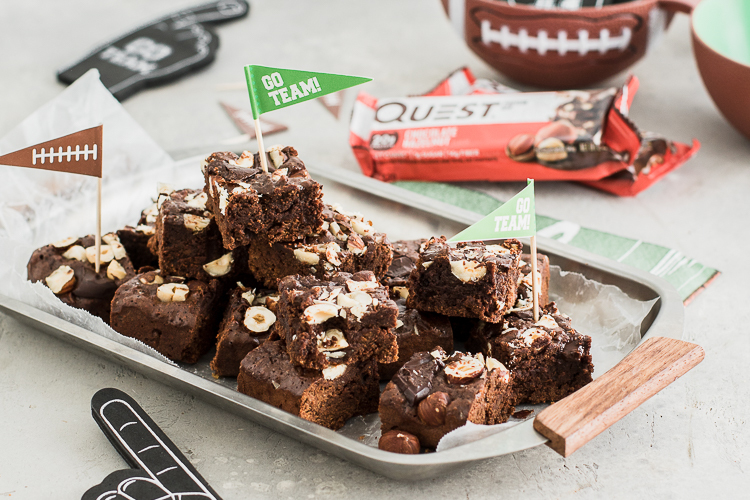 Break the Quest Protein Bars into pieces and place them on the baking sheet. Cook bar pieces in the over for 4-6 minutes. Remove and let cool completely before placing them into a blender or food processor and blending until fine crumbles form. Melt the 1/2 cup chocolate chips and butter in a microwave safe bowl until smooth. Place the crumbles, protein powder, cocoa powder, zero cal sweetener and salt into a mixing bowl and stir until combined. Add in the melted chocolate/butter, eggs and vanilla and stir until a thick batter forms. Press the batter evenly into the bottom of the 6×6 inch pan. Chop the hazelnuts into small pieces and sprinkle over the batter. Finish with chopped chocolate and bake for 15-16 minutes. Don’t over-bake the brownies or they’ll become more cake-like. Let cool completely before cutting into 16 squares and serving. In a heat-proof bowl, gently melt the chocolate in the microwave. Stop every 10-15 seconds to stir so the chocolate does’t burn. 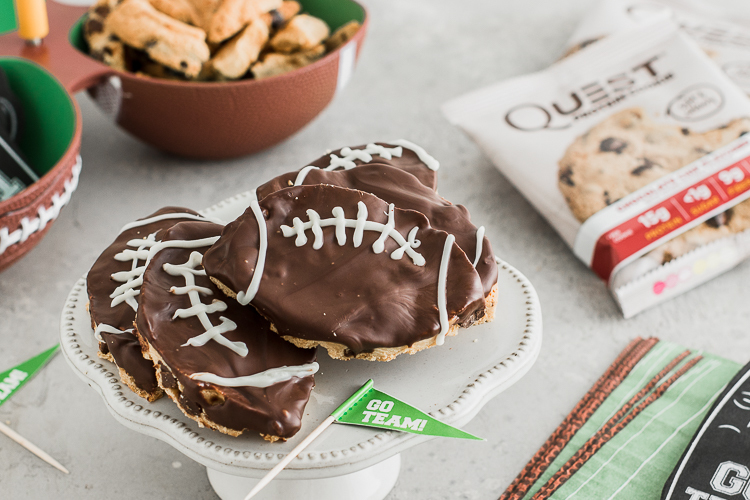 Cut out football shapes in the cookies using a sharp knife or cookie cutter (if available). Dip the tops of the cut-out cookies into the chocolate and place them on a piece of parchment paper. let the chocolate set at room temperature or chill in the fridge for 10 minutes. Written by: Levi Harris on February 1, 2019.